Bayern Munich goalkeeper Manuel Neuer revealed he has been playing with a splint on his thumb injury for a month, but insisted it has not affected him during games. Neuer missed three Bayern games in early February with the problem and there were initial fears that he could require surgery and be missing for up to three months. The Bayern captain returned against Augsburg on February 15, though, and has played in each of his club's last five games. 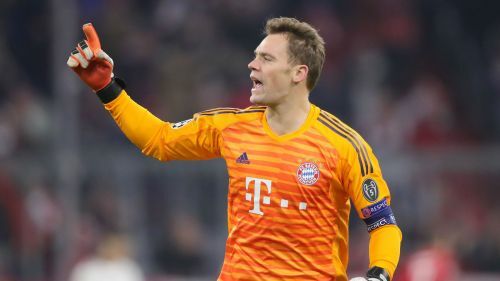 Neuer will line up between the sticks on Wednesday when Bayern face Liverpool in the second leg of a Champions League last-16 tie currently in the balance after the original encounter finished 0-0, and he insists the thumb injury is not causing him any issues. "We've not had to speak about my thumb for a long time now," he told a news conference. "Fact is, I've had to wear a splint on it during games since February. But it has [had] absolutely no impact on my performance." Neuer has kept three clean sheets in his past four appearances, including one at Anfield last month when Bayern kept Liverpool's much-vaunted front three quiet. That proved to be a cagey contest on Merseyside, yet Neuer is expecting a more expansive game in the second leg at the Allianz Arena. A penalty shoot-out would be on the cards if neither team finds a way through again, though Neuer insisted Bayern have not been preparing for such a scenario. "The tension in penalty shoot-outs is a whole different thing to football matches; you cannot train for things like that, which is why we don't bother."